To explain option trading, we need to move away from the stock market for a moment and consider some real life examples where the same principles work. The reason we do this, is because a person who holds options doesn’t actually own anything except a contract that gives them the option to buy or sell something at an agreed price by some agreed time in the future. An oft-quoted example to explain option trading, is the real estate market. Let’s imagine that you have your eyes on a piece of real estate you would like to buy. You don’t have the money or finance right now but would like to secure the asset for the price you are prepared to pay. In order to do this, you are happy to pay a ‘premium’ which gives you the right, but not the obligation, to buy that land for … let’s say $145,000 by a date 9 months away from now. So you enter into a legal contract with the seller to guarantee this purchase price, but only for the next 9 months, after which, the contract expires. Your end of the deal is to pay the seller $6,000 to secure the deal. If you don’t buy the land within the agreed time frame, you lose your $12k. 1. Before the contract expiry date, the current market price of the land has risen to $160,000 which means that if you exercised your contract rights and purchased the land for the agreed $145,000 you would be looking at an immediate gain of $15,000 less the $6,000 you paid for the option contract – a net gain of $9,000. If you were able to have access rights to the land during the contract period and make some improvements which increaesed its value to $175,000 at a cost to you of $5,000 then your overall gain would now be $25,000 less $6,000 for the options and a further $5,000 for improvements – a net gain of $14,000. Don’t laugh! This sort of thing happens in real life all the time. This is one of the simplest examples we can use to explain option trading. You simply transfer the same principles across to buying lots of shares instead of land. 2. The second scenario is, that the price of land falls or remains static, by the time the option to buy expires. If you choose to not exercise the option, you are out of pocket by $6,000 and have no asset to speak of. You may choose to still pay slightly above, or equal to the agreed $145,000 but now you will have to add the $6,000 you paid for the option contract to the overfall cost of the asset, which is $151,000. You could do this in the hope that in time, the market value of the land might rise and you’ll realize some profit, but on the face of it, it’s not looking like a good deal. Whether you want to apply the above principles to the stock, commodities or currency markets, makes no difference to the end result. Either way, the idea is that you enter a contract to either buy or sell lots of financial instruments (shares, commodities etc) before some future date for an agreed price. The “agreeing to sell” part allows us the flexibility of taking advantage of future price movements in both upward and downward directions. 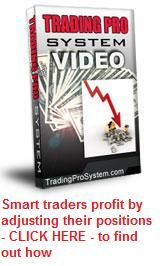 We can explain option trading to take advantage of falling share prices this way. Say IBM is currently trading at $125 but in a bear market, we’re expecting it to fall to around $100 in the next 3 months. Now imagine if at the end of this time, we were still able to sell IBM for $120. If the market price is $100 and we can sell for $120 we can realize an immediate gain of $20 per share. So we enter an option contract to “put” to the market 300 IBM shares for $120 per share. For this privilege, we pay $5 per share – a total of $1,800. After 3 months, the share price has fallen to $100 and we exercise the option. If we can sell the share for $120 when the price is currently only $100, we are looking at a gain of $20 per share, less the $6 it cost us to enter the contract. $15 (20-5) x 300 shares equals a net gain of $4500 – and we have achieved this without ever having owned an IBM share. This is the beauty of option trading … a wonderful thing called “leverage”. You can’t explain option trading without grasping the concept of leverage. But what you’ve read so far is only the beginning. In this section of our site, we will explore all avenues to explain option trading from the perspective of the beginner. So where do we go from here? Click on any of the linked items that interest you below to explore further. With any business venture there are always risks – and the risks of options trading are no different. Understanding these risks is crucial to successful trading.